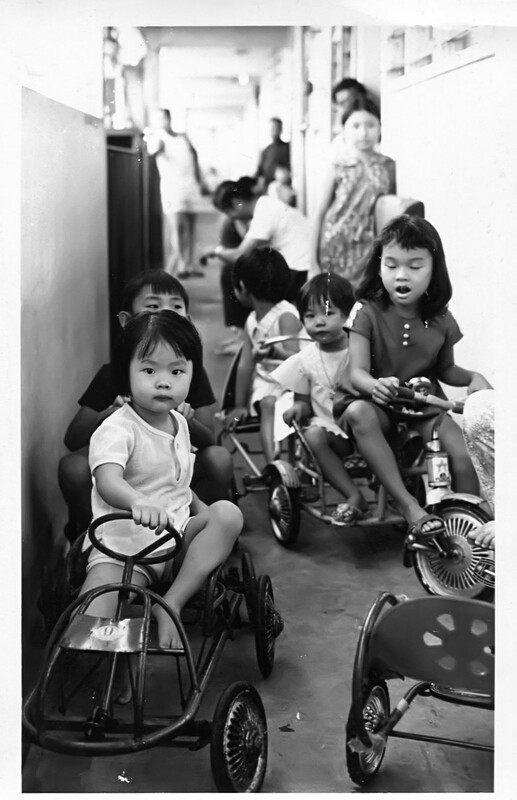 We lived on the 11th floor of the 14-storey high Templer Flats – Seremban’s Twin Towers – a welfare project for low-income families. 11 of us (9 kids plus our parents) crammed into a tiny 2-bedroom apartment. Each night the mattresses would be rolled out on the bedroom and living room floors to accommodate everyone. There was one toilet, which doubled as a dark room – my brother Choong Fee had taken up photography and had converted it into his personal photo-processing lab. I remember the thick black curtain which we had to draw aside to get into the toilet, the funny lights, the chemicals, the trays and all the negatives hanging from the toilet ceiling. I remember the narrow balcony where the neighbourhood kids and I would hang out on, with our legs dangling through the rather wide rails , looking down at the activity 11 floors below. Sometimes the kids would stick their heads through the rails for a laugh. I tried but couldn’t because of my over-sized head. I think I did manage to get it through once but got stuck and needed help to pull out again. My big head was a running joke in those days. There were eight apartments on each floor, all lined up in a straight row, and 2 elevators to service the building. Except for a couple of pot plants, there was almost no greenery. I never saw a caterpillar until I was probably about 8 or 10, and I remember the first time I did, I thought about it for a second before deciding I was terrified of them. They freak me out to this day. We played with the kids on our floor, in a pseudo-communal environment. One day, my sister Min Foong, five years older than me, came home crying. My mom asked what was wrong and she said one of the kids wouldn’t let her watch TV at their place. That upset my mom. We didn’t have a TV and had been freeloading off them for our TV fix each night. My mom was our strongest advocate and most tenacious defender. I remember she saw me crying once and asked what was wrong. I said one of the other kids had been mean. He was the resident bully on our floor, and had picked on me lots of times before. But not that time. To this day I don’t know why I said what I did. Anyway, my mom stormed up to his and got into a fight with her because of me and my lie. Back to the TV thing; that’s the story of how we ended up buying our very first, black and white TV. My mom was a proud woman and protective of her children. There were 9 of us, and yet I never felt from her that there was not enough love to go around. She loved us equally and in great abundance, something I would miss for the rest of my childhood. Disney’s Jungle Book was playing at the The Odeon, our local cinema, at the time. On top of his photography, Choong Fee was a gifted artist. My dad sewed a cover for our new TV and Choong Fee painted it with characters from that movie and Snow White and the Seven Dwarfs . It was exquisite. This is a pic of me posing next to our new TV. 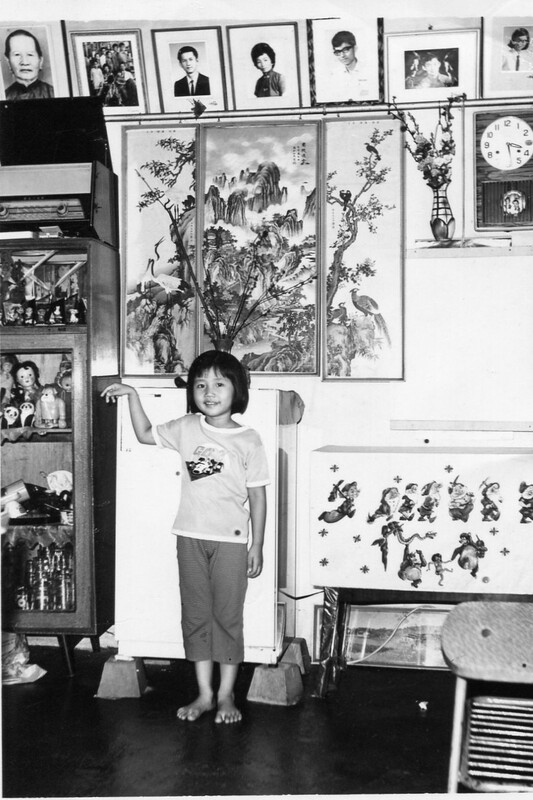 Next to it is a pic of playtime in the narrow corridor of my apartment floor, with my sister Chooi in the foreground.